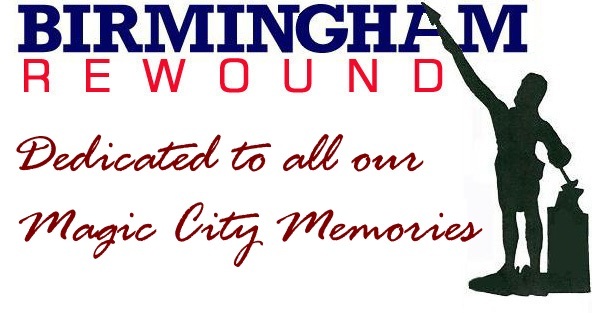 BIRMINGHAM REWOUND has a page tucked away in a musty, mothball-scented corner of Facebook. Like us, and .... well, I can't offer you a free coffee or 10% off your purchase, but I CAN say with confidence you won't be disappointed. We'll be featuring discussions and pictures (some you won't find on the main site!) and who knows what else. Come join our community, why don't you? 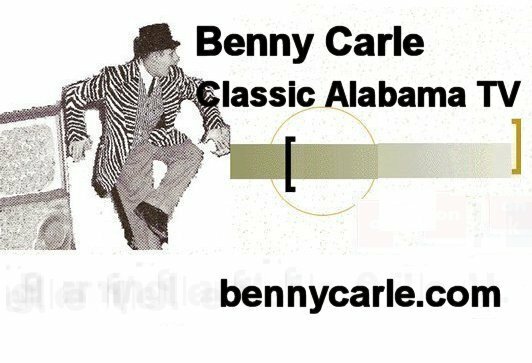 The Carle family - with help from Huntsville Rewound creator/webmaster Lance George - have created a website honoring the long career of Benny Carle, one of Alabama's most beloved "kiddie show" icons of old. His long career spanned both Birmingham and Huntsville. created and operated by Lance George. January 30, 2015: REWOUND is 10! New graphic header for the main page, added larger link to TMIH page. December 1, 2013: Added section on The Pizitz Enchanted Forest, 1973. April 1, 2012: April Fools gag ("Magic City Savings"). November 30, 2011: Added section on vintage Birmingham Centennial ads (1971). July 31, 2010: Added 50th anniversary salute to Eastwood Mall. May 20, 2010: Added link to Atlanta Rewound. 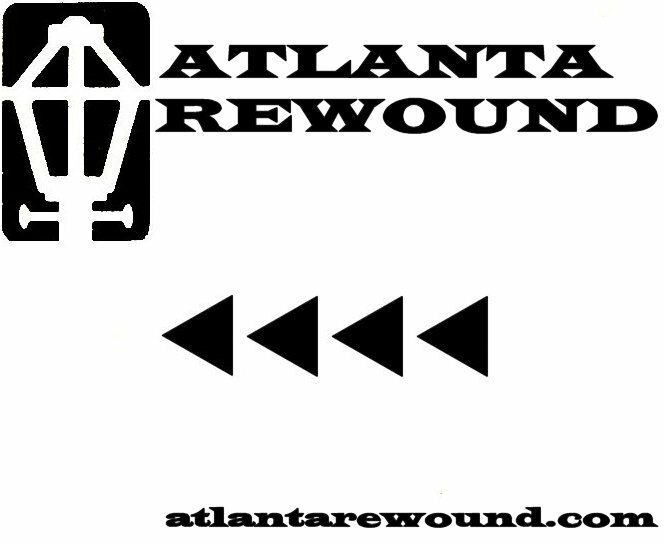 May 8, 2010: Added links to REWOUND Facebook site created Friday, 05/07. February 1, 2010: Added section for Western Hills Mall 40th anniversary. October 13, 2009: Corrected name of the 'mystery tonic' from VEGETOL to VEGE-CAL; Added pics from Webmaster of the iron man in Hartselle. September 12, 2009: Added another "Vegetol Man" picture from outside Hartselle (Morgan County), contributed by Mr. James Moody. August 31, 2009: Added "Vegetol Man" feature. August 14, 2009: Modified link for new website - Huntsville Rewound. August 9, 2009: Added link to newly-created Huntsville Rewound page on Facebook. January 20, 2009: Moved to new server. Old host is now inactive. December 12, 2008: Added 'favicon' (Vulcan's "key lime popsicle") to the site. Very special thanks go to Beth Walker for creating and submitting. December 6, 2008: Added two photos from K. Allen Culp, on the main page (Cousin Cliff & the Jack's Chicken). She also "cleaned up" the Pizitz and Rich's Christmas microfilm ads from the December 1978 page (Thanks!). November 30, 2008: Added image of "Birmingham History Map" from December 1968. October 30, 2008: Added page on the "Heidi game" in Birmingham and some pictures of 1960s Gardendale, courtesy of Robert Brewis. Moved "Quacker Jack" image to Jack's page. September 9, 2008: Added memorial item about Cousin Cliff, who passed away September 8th. July 6, 2008: Added link to News article on Cousin Cliff Holman (Alzheimer's). June 2, 2008: New section on 60th anniversary of KIDDIELAND. March 6, 2008: Aaron Tanner's A Centennial Tribute to Cora Saxon debuts. January 31, 2008: REWOUND remembers Valentines of Yesteryear. January 1, 2008: Debuted new title banners (using color scheme of old Birmingham streetcars). September 2, 2007: BIRMINGHAM REWOUND's Back-to-School Special. July 25, 2007: Took "Memories" section offline. Removed links from front page. July 21, 2007: Added mention of Ward McIntyre's passing to front page, with several pictures. July 6, 2007: Updated and put Eastwood Mall Remembered back online. April 17, 2007: Added scanned image of late '60s Shoney's Big Boy/WAPI-TV matchbook from Greg Glenn. December 3, 2006: Debuted new feature: a tribute to "Your Album Station", K-99 (WVOK-FM; WRKK). September 3, 2006: Added newly found snapshots from 1956 of the first Romper Room with "Miss Jean" Pierce. August 7, 2006: This month in history begins. July 3, 2006: New feature: Showplaces of the South by Tim Hollis. June 18, 2006: Brand new section: The Listening Room, with audio clips to listen and enjoy. March 2006: New section on Hill's Supermarket added. Added some vintage radio pictures to the RADIO-TV page. Also modified some text. Added newly-found picture of Birmingham's first Romper Room teacher, Miss Jean, to the MAGIC CITY KIDS' SHOWS section. February 2006: Some changes to TV history text on RADIO-TV page. August 2005: NEW UPDATES TO THE EASTWOOD MALL SITE ... many, many new pictures added! 05/30/2005: Special section added: "MAGIC CITY KIDS' SHOWS"
January 18, 2005: BIRMINGHAM REWOUND debuts. Copyright © 2004-2016, Russell Wells. All rights (and possibly some lefts) reserved. LEGALESE: This page is NOT sanctioned by, nor is it produced under the auspices of the City of Birmingham, Alabama. All graphics are self-produced; photos and other memorabilia found on this page originate from the private collection of the Webmaster, and from the high generosity of other, history-loving people (credited throughout the site). All logos, past and present, are the property of their respective owners. They're featured for historical purposes, and the Webmaster does not challenge any ownership rights. That you see them on a public website such as this does NOT translate to their being in the public domain! Bottom line: Please ask permission before using anything you see for your own personal gain. Violators will be forced to endure a fate worse than having to listen to the Webmaster sing: US 280!! What it all amounts to is simple, basic manners and good citizenship.